Standard Queen Bed with Sleep Sofa 1 queen bed, or 2 twin, with a sleep sofa, comfortable for 2 adults and 2 children. 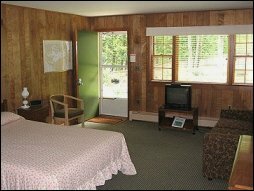 Room has a full kitchen, queen-sized bed or 2 twin and a pull-out sofa, color TV, and air conditioning. Steps from sandy bottom water. Standard Two Double Standard room 2 double beds, comfortable for 2 adults and 2 children. Room has a full kitchen, color TV, and air conditioning. Steps from sandy bottom water. Water View Queen & Double Beds Water view in the room with one queen bed and one double bed, comfortable for 2 adults and 2 children. Room has a full kitchen, color TV's, and air conditioning. Only steps away from waters edge. 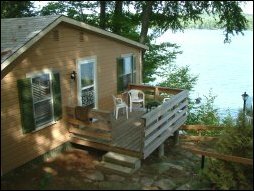 Waterfront Cottage Has one queen bed and a sleep sofa and is located at waters edge with a private deck. 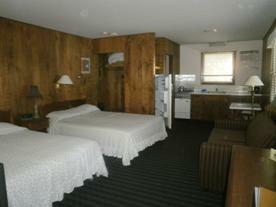 Room has a full kitchen, queen-sized bed and a pull-out sofa, color TV, and air conditioning. 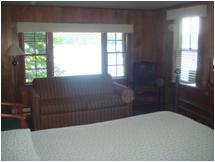 One Bedroom Suite Has queen bed in the bedroom and a sleep sofa in the living area. 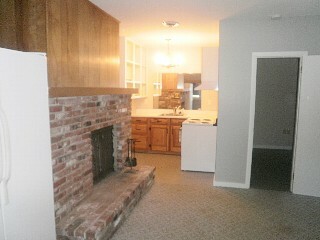 Suite has a full kitchen, washer and dryer, color TV, fireplace, and air conditioning. Copyright © 2010 King Birch Motor Lodge. All rights reserved.